Weld in injector bungs - Miata Turbo Forum - Boost cars, acquire cats. We now carry weld in injector bungs! 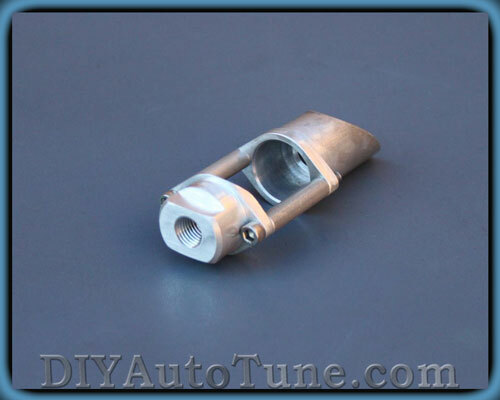 These are designed to use a hose fitting instead of a fuel rail, so you don't have to worry about lining up all the injectors precisely with your fuel rail. You can use them for adding staged injection to the manifold or charge pipe, converting carbed manifolds to EFI, or making your own race manifolds. TIG them to your manifold or epoxy them on with JB-Weld. These are made in the USA from billet aluminum. Price is $38.50 each. You should call them intercooler ports. You'd make millions. It only counts if you are also running a PC-PRO. I should make use of my stock injectors and run staged so I quit maxing out my 460s. New Clearance section of our catalog!